The following 28 events in 21 Arab and Middle Eastern countries were listed in “Google News” during the week of September 21-28 under the key words “International day of peace” and اليوم الدولي للسلام. This also includes some events listed on the websites of the Global Feast for Peace, and event map for the International Day of Peace..
KÉNITRA, MOROCCO : A portfolio of the artistic productions of students from Groupe Scholare Balzac of KÉNITRA to celbrate the International Day of Peace. ISMAILLIA, EGYPT : The National Council for Women (NWC) will organize a celebration of the International Day of Peace on Wednesday under the patronage of Lieutenant General Mehab Memish, head of the Suez Canal Authority and General Yasin Taher, governor of Ismailia. They will launch a balloon carrying messages “Together against terrorism and extremism” from one of the locomotives of the Suez Canal Authority, in addition to taking part in a cultural celebration at the General Library of Egypt, Sheikh Zayed. SHARM EL-SHEIKH, EGYPT :The Central Administration of Pioneers in the Ministry of Youth and Sports, under the patronage of the Minister of Youth Eng. Khaled Abdulaziz, carried out the activities of the International Day of Peace in Sharm El-Sheikh under the slogan “Art as the Way of Peace”. Participating in the popular arts exhibition, in the courtyard of the Sahaba mosque in Sharm el-Sheikh, were artists from the departments of youth and sports, in the governorates of Alexandria, Port Said, Ismailia, Minya and Marsa Matruh. GHARBIA, EGYPT : The National Council for Women in Gharbia Governorate organized a conference in the conference hall of the governorate’s General Directorate entitled “Women Who Make Peace Together against Extremism and Terrorism”, on the occasion of the International Day of Peace. The aim of the conference was to consolidate the role of women in establishing a culture of peace, fighting extremism, stirring brotherly spirit among the people of the homeland, rejecting hate speech, rejecting the other and consolidating the role of women in dealing with the effects of terrorist events and restoring national balance. BAGHDAD, IRAQ : International Day of Peace in the National Theater of Baghdad – video of event. DOHA, QATAR : Qatar Academy, the world-class baccalaureate school operating under Qatar’s pre-university education, celebrated World Peace Day on September 21 as part of an event that brought together students, faculty, families and board members. MANAMA, BAHRAIN : Under the patronage of the Minister of Labor and Social Development Jameel bin Mohammed Ali Humaidan, the United Nations in Bahrain and the Baha’i Social Society organized an evening on the occasion of the International Day of Peace to promote and consolidate the concept of peace, coexistence and human values ​​in support of unity and brotherhood for peace”. BEIRUT, LEBANON : Under the auspices of the United Nations Information Center in Beirut and the Baddan Cultural Social Club, Media for Peace-MAP will honor the International Day of Peace at a ceremony to showcase young artistic talents on Friday, 29 September from 17:30 to 20:00 : 30 pm, at the Baddan Cultural Social Club, Aley. The event will be held in partnership with the Dafi Charitable Society and the Youth Path, and will be entitled “Join us to convey a message of openness and peace from Lebanon to the world.” The Youth Artistic Talent Show aims to celebrate the International Day of Peace through arts of all kinds. The event is attended by talented young people who sing, dance and play music. ADDIS ABABA, ETHIOPIA : Strengthening the capacity of young people to maintain African peace, improve the economy and promote political participation is important. This was the message of the celebration of the International Day of Peace under the theme “Engaging youth in peacebuilding ” today in the African Union Hall. International organizations, diplomats, human rights defenders and relevant institutions participated in the event. “This slogan has been celebrated to highlight the role of young people in achieving peace and development,” said AU Commissioner for Peace and Security Ismail Shragine. MADABA, JORDAN : The World Youth Forum at the American University in Madaba started on Friday evening, organized by the Jordanian Caritas Association and the participation of youth delegations from 30 Arab and foreign countries. The opening ceremony was attended by Patriarch Fouad Twal, the Charge d’Affaires of the Papal Embassy in Amman, the Archbishop Mauro Li, the President of the American University in Madaba, Professor Nabil Ayoub, and a number of religious, diplomatic and official figures. . . . . The two-day forum will provide expertise, technical testimonies and paragraphs on peace and various workshops. It is expected that at the end of the conference, the appeal of the world youth for world peace will be issued to participants. ADEN, YEMEN : The Foundation for Human Rights established an open community meeting on the occasion of World Peace Day at the Victoria Park in Al-Tawhiyyah under the slogan “Peace is our identity … Peace is our culture … Peace is our humanity …”. . . .The youth group of the Foundation for Human Security presented a silent play aimed at supporting the creation of a pro-peace figure to confront the problems and issues in the society of child recruitment, regionalism, hatred, carrying weapons, racism, drugs and other negative phenomena. The events also included the launch of youth messages to the world through the platform of social networking sites to disseminate and promote the culture of peace among young people in the world. IBB, YEMEN : Students of the Department of Sociology and Social Service at the University of Ibb organized today a speech, artistic and theater event on the occasion of the International Day of Peace under the theme “Strengthening the role of youth in spreading the principle of peace”. The Dean of the Faculty of Arts, Dr. Aref Al-Ra’awi, stressed the importance of this occasion in light of the continuation of the aggression in Yemen. He called it a victory for the blood of the martyrs who were targeted by the aggression. For his part, the head of the meeting, Dr. Abdul Salam al-Faqih stressed the necessity of activating the role of youth in spreading the culture of peace and promoting cohesion among all members of society. The ceremony included artistic and musical passages, songs from the province’s schools, and poems about the importance of peace. MUKALLA, YEMEN : On the occasion of the International Day of Peace, the city of Mukalla, capital of Hadramout province, on Saturday, 23 September, launched a campaign to promote a culture of peace and renounce extremism. The campaign activities include field visits to schools, institutes and residential areas, artistic presentations and educational lectures aimed at shedding light on the importance of civil peace and rejection of intolerance. “The goal is to spread the culture of love and peace, to promote the values ​​of civil peace in society, reconciliation and tolerance among people,” said Khalil al-Nubi, peace ambassador for the Arabi organization, which organizes the campaign. SABA, YEMEN : The capital’s secretariat will witness Sunday’s “Peace Yemen 2017” marathon organized by a movement on the occasion of World Peace Day “September 24”. The marathon, which is held under the slogan “Stop the war on Yemen and lift the siege,” includes various age groups, including the elderly, as well as people with special needs, the head of the Save the Prophet Noura al-Jarawi told Yemen News Agency. She said that the race starts from field 17 and ends at the stadium in Al-Dharafi area of ​​downtown SANA’A. She expected the participation of more than a thousand participants from various bodies such as clubs, sports federations, schools, government institutions, civil society organizations and activists. In addition to the above events, there are a number of events in Latin America and the Caribbean listed on the event map for the International Day of Peace. One is the “Peace Ball” project of ELAZIG, TURKEY which works to get game balls to community leaders, people, foundation, company around the world to help street children and refugee children to play. Another is “Songs for Peace” from MUSCAT, OMAN which will celebrate the International Day of Peace with a range of songs and readings centred around the theme of peace. 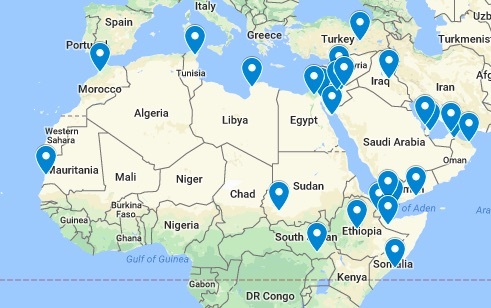 Many cities and communities are members of the International Peace Cities network and the following are listed on the Global Feast Map as celebrating a feast to mark the International Day of Peace. They include TUNIS (TUNISIA), ADDIS ABABA (ETHIOPIA), BENGHAZI (LIBYA), DUBAI (UAE), HARGEISA and MOGADISHU (SOMALIA) and JUBA and NYALA DARFUR in SOUTH SUDAN.